The desmid Netrium digitus has a beautifully folded chloroplast What are algae? The term 'algae' is used for some lower plants and many, often unrelated groups of microorganisms that are able to perform photosynthesis. Photosynthesis (converting light energy into chemical energy) is performed in parts of the cell called chloroplasts. They can be found in different shapes and colours and in many different organisms. Not all these organisms are green. Diatoms, Chrysophytes and dinoflagellates have yellow to brown chloroplasts. There are brown algae (Phaeophyta), red algae (Rhodophyta) and many other groups of unicellular algae in many shades of green. The blue green Cyanobacteria also photosynthesize. A very diverse groups of freshwater algae are the Chlorophytes or Green algae. Based on the compounds of the photosynthetic pigments and several other characteristics they seem closest related to plants. A common green algae is Hydrodictyon, the water net. It is a related to Pediastrum (top image) But it forms a bag-shaped colony. Like Pediastrum each individual cell can develop into a new colony. You can imagine that since the colony contains thousands of cells Hydrodictyon can reproduce very rapidly. And unlike Pediastrum, Hydrodictyon can grow large, almost 30 cm. in length. Blooms of Hydrodictyon can be a real problem for water treatment plants. The image shows a part of a small colony (left) and three individual cells of a big colony. Inside each of these cells a new colony can be formed. If you have a birdbath with water that has turned red you may find the green algae Haematococcus pluvialis. 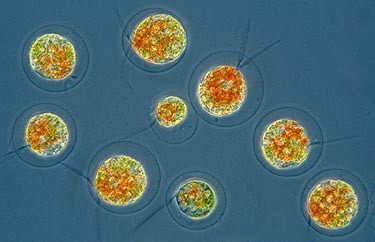 This species illustrates that green algae don't always have to look like green algae. 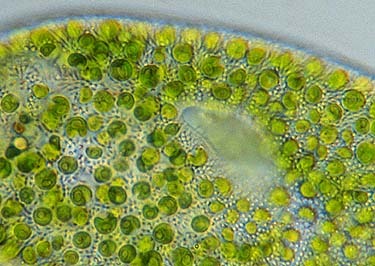 The chloroplast often turns red when conditions become unfavourable. Haematococcus swims with the aid of two long flagella. Many species are flagellated and motile, other are immobile but often have a flagellated stage at some time in their life cycle. 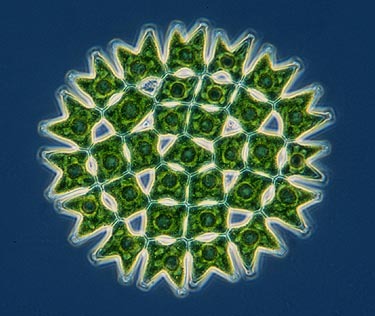 Certainly one of the most spectacular flagellated green algae is Volvox. It forms a spherical colony. All the small cells of the colony possess two flagella and a small eyespot. With this the colony is able to swim towards the light. Volvox has interesting ways of reproduction. 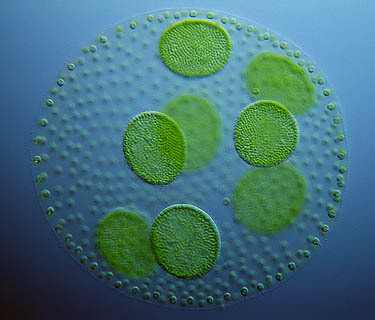 Find out much more about it in the Micscape article Volvox, one of the seven wonders of the microworld. A small rather inconspicuous green algae without undulipodia is Chlorella. It can be found as an endosymbiont inside ciliates, hydra and other animals. They raise Chlorella as if they grow crops in a greenhouse. 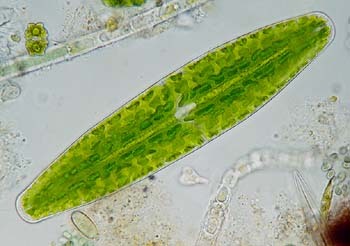 The close up of this green Paramecium bursaria, a ciliate, shows the individual cells of Chlorella. Many green algae form long filaments. The cells stay attached after they divide. Some genera, like Spirogyra, Mougeotia and Zygnema can become so numerous they form dense mats of growth in surfaces of ponds, so-called pond scum. This pond scum is interesting for a study under the microscope. If you squeeze it in a jar you will collect many interesting organisms. And the filamentous algae are at least as interesting. 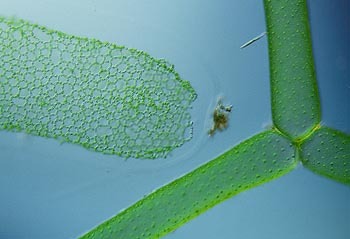 The chloroplasts have distinct shapes. In Spirogyra the chloroplast runs through the cell like a helix. The image also shows the nucleus hanging on fine threads. 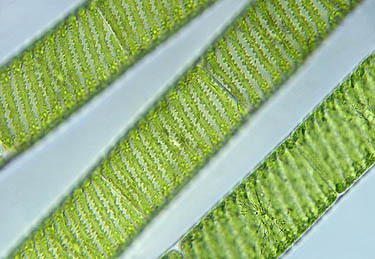 Spirogyra and related algae like the Desmids are conjugating green algae. These desmids are so beautiful they deserve a page for themselves. Click to see how this conjugation occurs in Spirogyra!